How often do you wash your makeup brushes? If your answer is less than often, I have a few scary facts to share. Brace yourself! Makeup build-up on brushes and sponges is bacteria heaven. Using a dirty makeup applicator can cause breakouts and eye infections. Introducing bacteria into a liquid product, or onto the surface of a powder product, can cause contamination. And better yet, With improper care, brush bristles can get damaged and fall out. Now, if you're wondering how to clean your brushes, read-on! I would recommend washing your makeup applicators (brush, sponge, powder puff) Once every two weeks. More often with cream/liquid products, less often (still try for two weeks) with powder products. Use warm water and a mild soap to gently, yet thoroughly, wash the makeup out of the brush bristles. Leave brushes FLAT to dry, either on the edge of a counter or resting on a towel. Do not sit the brushes upwards when bristles are wet since water getting into the brush core will cause the glue to loosen and bristles to escape. 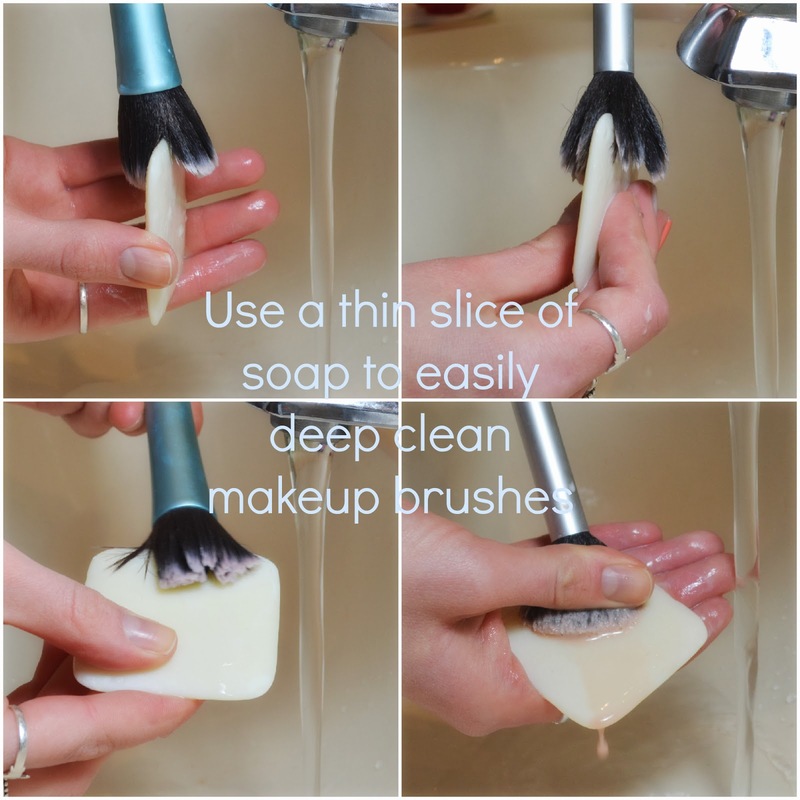 Here's how I use a think slice of soap to wash brushes, one option being the Dr. Bronner's bar soaps. Note: If your makeup products start to take on a funny smell, either give them a good clean or toss and replace. Dr. Bronner's Magic Soaps are available at almost all nutrition/vitamin stores and now at American Apparel, both in bar and liquid form.